Reuben may be prepared and served in a complex way and baked in different restaurant appliances. However, here is a recipe for a simple homemade sandwich, provided that you have a toaster or a frying pan. 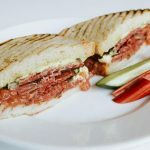 Onion chutney sandwich is yet another version of a pastrami sandwich that got quite popular among all meatlovers! 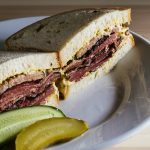 Onion chutney mixed with our pastrami is basically a masterpiece – but don’t believe us, check it for yourself! In July Chanterelles will take over our kitchen! Warsaw eats at the Night Market, Cracow eats in our restaurant Food & People by Pastrami Deli. If currently you’re not in the Krak’s city nor the capitol, you can prepare this special in your own kitchen! 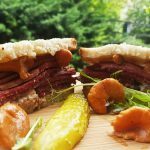 Here we’ve got for you yet another, inspiring version of our pastrami sandwiches! 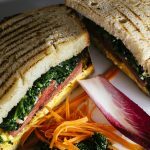 We talk about President’s Sandwich – an absolutely brilliant combination of kale, hazelnuts and our pastrami! 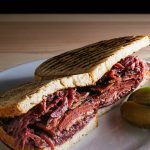 We invite you to try out our version of a classic pastrami sandwich – an easy, homemade way. The preparition will only take few minutes but the taste will remain in your memory forever! 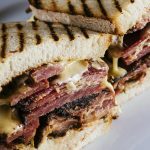 We warn you: pastrami can be addictive! 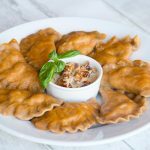 Since many years it is believed that dumplings are a classic polish cuisine dish – but this isn’t quite true. We need to mention that dumplings had its origins in China. In our country it got popular because of bishop Jacek Odrowąż who fell in love with its taste while his visit in Kiev. Now, back to our times! These days people are more and more into fast food because it gives them some kind of comfort and a bit more of free time. That’s why we had prepared yet another experiment with pastrami – pastrami dumplings. And you can eat them with a dried tomatoes sauce! We have already tried it and it was delicious! Check it out for yourself!